Please bookmark this page and join the HamSCI-Eclipse mailing list for further announcements. Rapid changes in ionospheric electron density caused by the motion of the shadow of an eclipse is known to cause Doppler shifts on HF ray paths propagating through the eclipse region. For example, see Figure 7 in Boitman et al., 1999. We request that all amateur radio stations capable of making high-quality HF frequency measurements participate in this experiment and publish their data to the HamSCI community on the open-data sharing site zenodo.org. 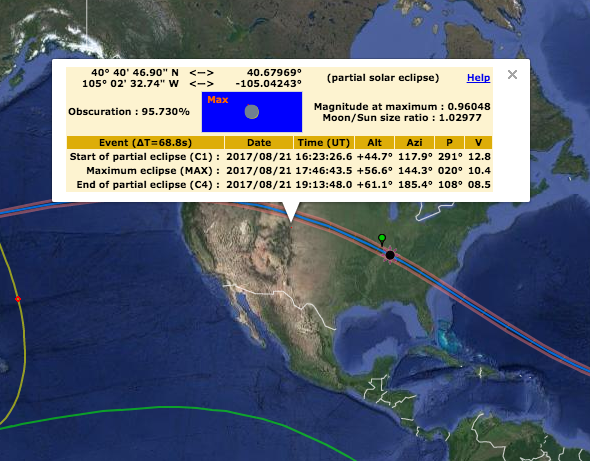 How does the 2017 Total Solar Eclipse affect HF propagation paths? Measure HF path Doppler shifts caused by the motion of the eclipse shadow across the ionosphere. Note: Partial eclipse begins 21 Aug 2017 at about 1600 UTC in Oregon ends at 21 Aug 2017 at about 2015 UTC in South Carolina. Any and all observations that can unambiguously measure the characteristics of the beacon signal are welcome. Recommendations for participation are listed below; please choose an option that matches your interest, equipment capabilities, and skill level. To make narrow-band, precision frequency observations of the beacons, we recommend following the instructions on the Spectrum Lab Solar Eclipse Instructions Page. Please note that we understand that there are multiple ways of making accurate Doppler shift measurements. Please feel free to use an alternative procedure as long as it is technically sound and can adequately describe the procedure you used in your final data submission so that others will be able to properly interpret your measurements. 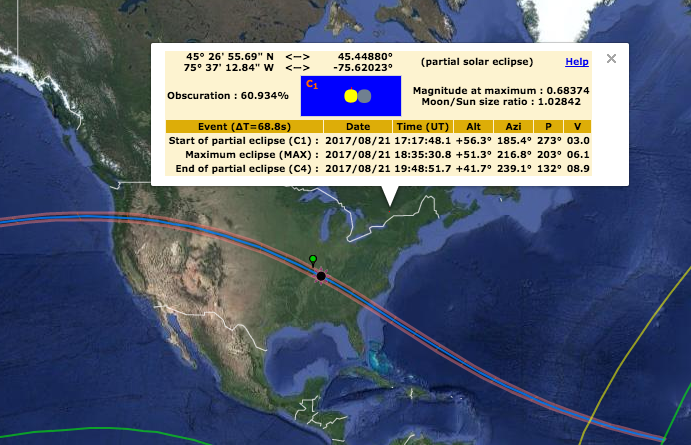 Receive stations south of the eclipse path should monitor CHU, while receive stations north of the eclipse path should monitor WWV. This will ensure that the signal path crosses the eclipse. You can find your location relative to the eclipse path with Xavier Jubier's Eclipse Map. Measure as many frequencies as you are able continuously and simultaneously. Do not frequency-hop or otherwise alternate between frequencies. The greatest effect is expected at the lowest frequencies, therefore prioritize measuring the lowest frequencies. We ask that all data generated by these experiments be uploaded to the HamSCI community on zenodo.org. This includes observation period data from the control day and the eclipse day. By uploading to zenodo.org, a permanent, citable, centralized record of the data that is openly available to both researchers and the general public will be created. To upload your data create an account on https://zenodo.org. You can create a login using your github account or via their account creation. Once you have an account and you are logged into the service visit “https://zenodo.org/deposit/new?c=hamsci”. Select your file(s), click “Start Upload”, select “Dataset” as your upload type, fill in all relevant information regarding contributors, and finally click "Save" and then “Publish” in the bottom right. In the Notes box, you may include your personal comments regarding your observations.